There are some truly great landmark residential streets scattered throughout Chicago. Streets like Astor, Deming, Hawthorne and Hutchinson on the city’s north side and Prairie and Kenwood Avenues as you travel south. These streets are populated by magnificent historic homes often set on huge suburban-sized lots. Homes from this era are unique for the simple fact that the skilled trades that went into their construction have all but died out today. These gems rarely come on the market, but when they do, everyone takes notice. Case in point: the home I recently sold at 526 W. Deming. This eight bedroom house was built in the early 1900s for Chicago’s Imperial Russian Vice Consul. It is loaded with priceless hand-crafted architectural details including leaded and stained glass windows, hand-carved paneling, mantles, a grand staircase, and numerous fireplaces surrounded by handmade mosaic tiles. It is also set on a massive city lot with a four-car garage and a two bedroom garden apartment. (You can see the full details in our PDF brochure here). In preparing to list this home for sale, I dug into historical archives (including those of the now defunct Chicago Daily News) to learn more about its history. What I found was a goldmine of drama and intrigue. The wife of the couple who built the house was from a prominent Chicago family. Her husband was a Russian Prince with a fancy title but no money. After years of marriage, she asked for a divorce in light of her husband’s extramarital relations. He said it was a matter for the Czar to decide, and she took it to the Supreme Court which granted the divorce! He went on to marry another wealthy socialite, and the tale continued. 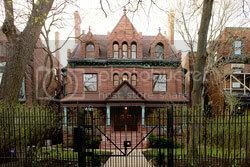 Their storied history and the home itself was featured last week in a Sun Times article and in a video news story on their website. (You can view both pieces here). After receiving multiple offers, the home went under contract in less than 30 days for a price in excess of $4 million – a very pretty penny indeed!